Catherine Wiggins made the comment on Facebook. 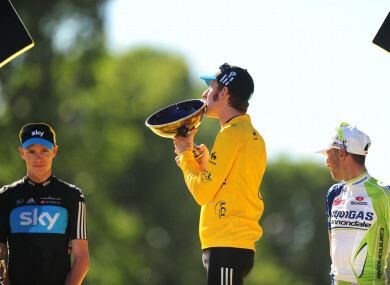 Froome and Wiggins after the 2012 Tour de France. CATHERINE WIGGINS, THE wife of former Team Sky rider Bradley, has apologised for describing Chris Froome as a ‘slithering reptile’. Wiggins made the comments on social media after sharing The Guardian’s article announcing Froome’s adverse drugs test which showed he had double the permitted limit of Salbutamol, a legal asthma drug during this year’s Vuelta a Espana. “I am going to be sick. Nothing in the news. If I was given to conspiracy theory I’d allege they’d thrown my boy under the bus on purpose to cover for this slithering reptile,” she said. Despite being former team-mates, there is no love lost between Froome and Wiggins, after the former was asked to help Wiggins win the 2012 Tour de France, a race Froome thought he should have been team leader for. And late last year, Froome claimed it was “healthy” to ask questions about Wiggins’ use of the anti-inflammatory drug Triamcinolone on three occasions. Email “Bradley Wiggins' wife apologises for calling Chris Froome a 'slithering reptile'”. Feedback on “Bradley Wiggins' wife apologises for calling Chris Froome a 'slithering reptile'”.